I'm on another one of my occasional city jaunts. I had some spare time to explore Boston today, so went walking around the city centre, intermittently following the Freedom Trail which is a route marked by a red line around the town. Only intermittently though, as after a very short period of time I decided that I didn't like being told where to go (where's the freedom in that?!). On one of my detours I found myself unexpectedly coming into the Granary Burial Ground by its north entrance. 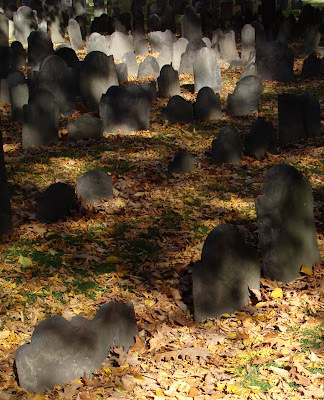 I spent quite a while in this graveyard, which was peaceful and covered in fallen and falling leaves. It was one of the few places in the city where you could feel connected to the original inhabitants, away from the noise and bustle of everywhere else. 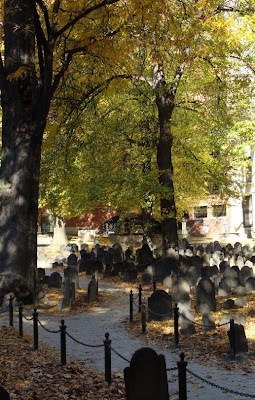 I suppose it is entirely predictable of me to prefer to spend time in those parts of Boston that are quiet and full of trees and history! You are in my neck of the woods right now. I'll be in town (Cambridge) on Wednesday morning working at the Sign of the Dove (an artist's cooperative). Pop in if you are in the area. We occasionally get tourists here, but I'm not quite sure why. You wouldn't like the area. Porter Square recently had a face lift. They hired an artist to design it and it is awful. We were told it would add some green to the area, but they covered it in concrete. The pattern makes it look like a cross walk. Ick! I was hoping for plants and they gave us concrete. We do have some very nice crafters in the store though. So there is at least some pretty thing here. Very much struck by the light. Lucy - the weather and the light were glorious and I couldn't stop taking photos in both graveyards. My favourite one (in terms of light and darkness) was of a cherub in the older burial ground. That cherub is so cheerful. Lovely face and newly returned from the hairdressers. Lucy - were you there in Boston with me? Because I kept walking past smart salons and wondering whether I should get a proper haircut while I had the chance. I didn't (it's been over two years since I did. Oh dear.). Now writing this has reminded me of something else. Did you ever read any of Lucy M. Boston's books? I used to love The Children of Green Knowe.